Do you want to get fit by the end of the year? 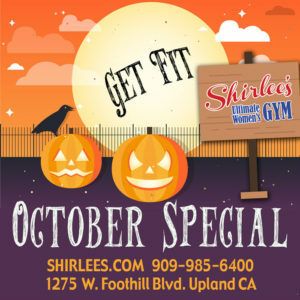 Then get started on your fitness journey before Halloween with Shirlee’s Personal Training/Membership Special. Purchase a package of 5 1-hour personal training sessions for $300 and receive one month of membership FREE. Your trainer will assess your personal situation and show you exactly what you need to do to achieve your goals. She will teach you how to use all our equipment safely and effectively and work with you to establish a routine tailored just for you. This special is for new members who like our FB page. Membership includes all regularly scheduled group classes at no additional cost. Call today for more details. Now is the time to get stronger and healthier! We invite you to stop by the club for a tour and a free trial pass. To learn more about all our current specials, please call (909) 985-6400. Inter Valley Health Plan: Are you a member of Inter Valley? Ask about our discounted rate for plan members. We have a special corporate rate for Inter Valley. Call for details. Regular prices below. Call for all our current specials and to learn which plan best fits your needs. Annual maintenance fee of $24 applies. Join now, and be on your way to a stronger, more energetic, and more confident life by the end of the year.